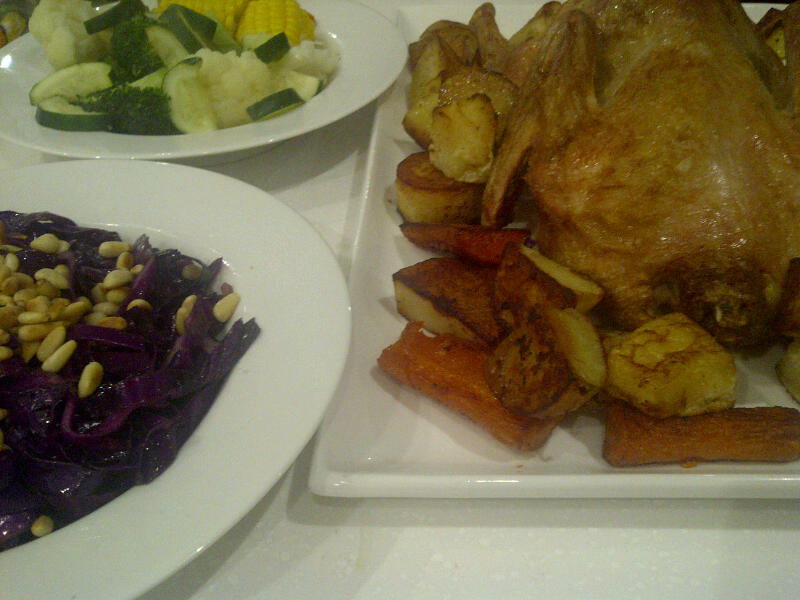 I cooked roast duck for dinner last night, as you do, on a Tuesday. When you’re mad. Actually, the only insane part was how easy it was. I’ve always avoided cooking duck because I thought it would be tricky. But it was just like cooking a chook. I simply chopped off the neck, washed the carcass, rubbed it with a bit of olive oil, sprinkled it with some salt, shoved a few segments of orange up its bum and it was good to go. I used a 2kg bird and roasted it at 190C for 1 hour and 15 minutes. About 30 minutes before it was due out of the oven, I chucked chunks of potato, parsnip and carrot into the duck fat beneath the bird to roast. While the duck rested on the bench for 10 minutes, I left the veg in the oven to finish and got to work on the red cabbage salad. Admittedly, making the salad was a bit stressy, but I had to do something with the red cabbage Farmer’s Direct sent me last week. The meal was absolutely delicious. But you don’t get much off a duck. It barely fed the four of us and it cost $19. To offset the expense, I used the neck and wing tips to make duck stock, which I will use for a risotto later in the week. METHOD: Toast pine nuts in a frying pan until golden. Set aside. Add duck fat to pan. When hot, add garlic cloves and saute until softened. Add anchovy fillets, saute 1 minute. Add red cabbage and toss in pan until it begins to soften and wilt. Drizzle with red wine vinegar and serve sprinkled with pine nuts. This entry was posted in RECIPES and tagged red cabbage salad. Bookmark the permalink.